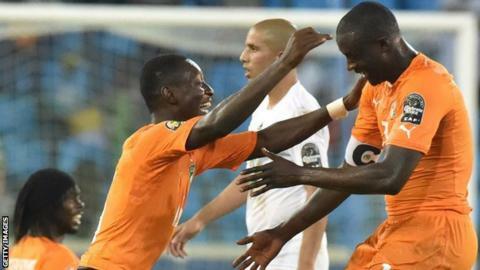 Ivory Coast boss Herve Renard believes now is the time for the Elephants to fulfil their potential and win their second Africa Cup of Nations title. They take on DR Congo in Wednesday's semi-final eager not to add to recent failures, including the 2012 final loss to Zambia, who were coached by Renard. "We've a good balance between hard workers and talented players, this combination is perfect," said Renard. "The only thing is to win (the Cup). We won't be satisfied with anything else." The Elephants, who won their only Nations Cup title in 1992, face DR Congo in their semi-final in Bata on Wednesday, and once again find themselves installed favourites. Is is a position they have occupied - and failed to live up to - in the past five editions of the tournament. "We came here a fortnight ago with no expectations on us. No-one was taking about us but this has changed over the last two weeks. Things change fast in football," added Renard. "After our last two wins over Cameroon and Algeria, now we are the favourites of the bookmakers but that can be dangerous. It is also not important. What is important is what happens on the field." Some key players from the so-called 'Golden Generation', not least Didier Drogba, have moved on, but Manchester City midfielder Yaya Toure remains and Wilfried Bony, the continent's most expensive player, who now shoulders most of the goalscoring burden. Renard, who was appointed coach of the Elephants only in July, believes the older players' ability to learn from past mistakes and the introduction of new faces has brought the right blend in the team. "The players with a lot of experience have many bad experiences," Renard said. "But we seek to use the bad as a means to motivate and get success. "And this is not the Ivory Coast of the past. There are a lot of new players who I'm sure not many of you knew about before this tournament. "These new players worked very hard in the preparations and showed me they are able to play in the starting line-up." Ivory Coast started with two draws in the group stage but then beat Cameroon 1-0 in their final pool match. And following their 3-1 victory over top-ranked Algeria in the quarter-final, Renard has only thing in his mind. "I am only interested in winning," he declared.